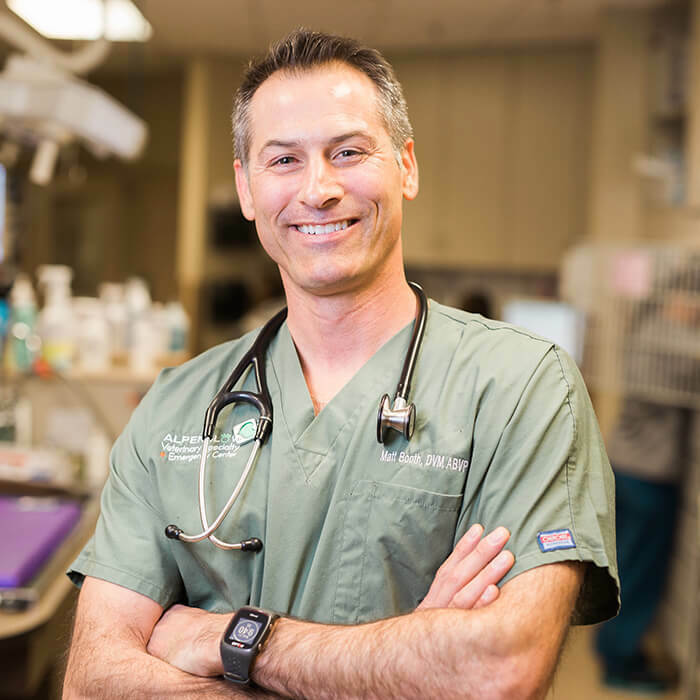 Matt Booth, DVM, DABVP (Canine and Feline), is a veterinarian in the 24/7 emergency and critical care department at our Boulder location. Dr. Booth grew up in Virginia Beach, Virginia, and was an avid surfer and alpine skier. He attended the University of Georgia for undergraduate and veterinary school. During this time, Dr. Booth was employed as a veterinary technician at a general practice and the critical care unit at the university. This experience led Dr. Booth to recognize his passion for small animal emergency and critical care. Dr. Booth graduated veterinary school and had an unusual entrance to critical care and emergency medicine. He began working in Augusta, Georgia, where there was a great shortage of this type of veterinarian. Through mentorship by Dr. Roger Gfeller, DACVECC, Dr. Booth immediately became the primary emergency clinician. In 1999, Dr. Booth moved to Boulder County where he has continued to practice critical care, emergency medicine, and surgery. Dr. Booth desired a higher level of understanding of canine and feline patients and in December of 2011, he became a Diplomate of the American Board of Veterinary Practitioners in canine and feline practice.